It's another Timeless Tuesday challenge and Ally is your hostess! Ally's challenge to you is all in the date! 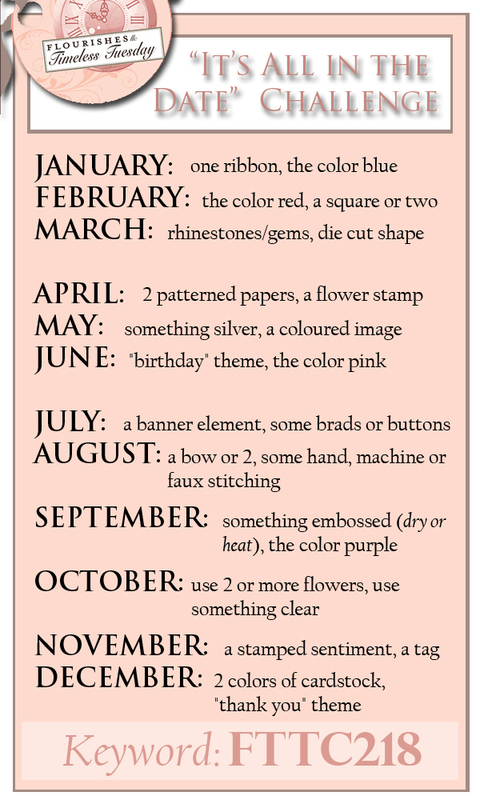 Below is a chart for you to find your birth month and to follow that recipe for your project or card. My birth month is December and this is my card based on the recipe. I cut it out with my circle nestie to be popped up in the center. For my two cardstock selections is from Flourishes Color Made Easy in Sunflower and accented with some chevron dp from MME's In Bloom collection. The trim is some cotton trim from my local fabric store. 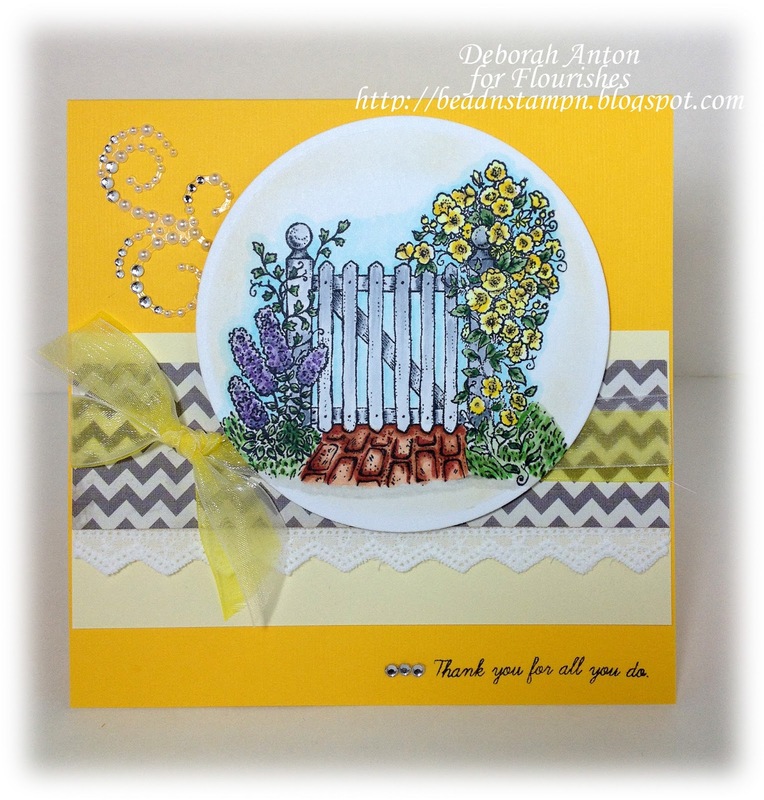 I finished off the card by adding some sheer ribbon in both white and yellow and some Prima mini flourishes. Be sure to check out the other Timeless Tuesday Team's creations with these fun recipes! Today I wanted to share with you a card that I made as a Father's Day card. 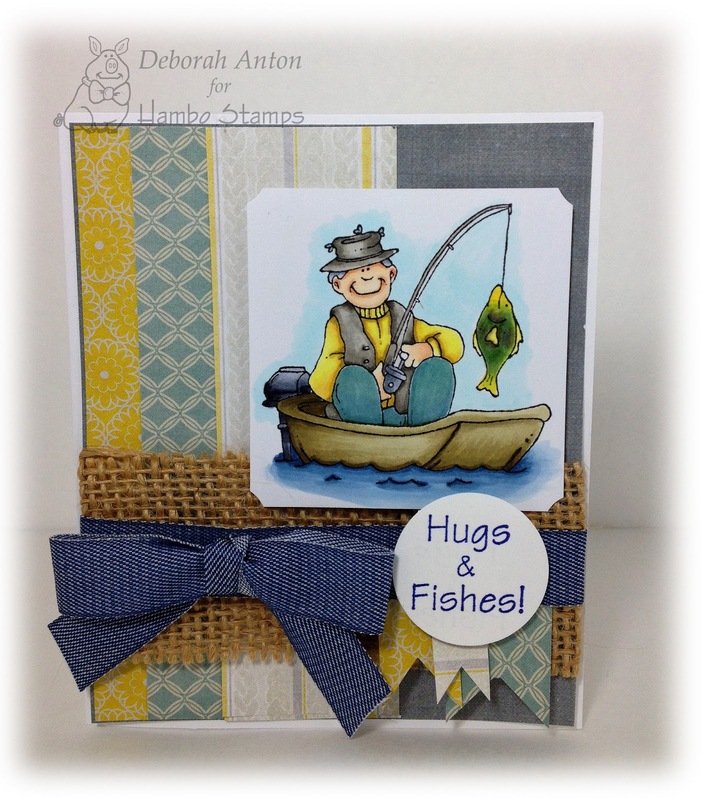 But it can be perfect for any masculine card- especially for that someone who loves to fish! The image 'Fisherman' and sentiment is Hambo Stamps, colored in with Copics. The fun paper is Pink Paislee's Indigo Blue which you can also find over at Hambo. I used 4 different patterns for this card starting with a solid layer and overlaying the three patterned strips. I used a piece of burlap I had for the top layer, overlaying that with some fun and yummy denim ribbon from the Stamp Simply Ribbon store. This ribbon is so much fun! I finished the card by popping up the image and sentiment with some fishtail banners. 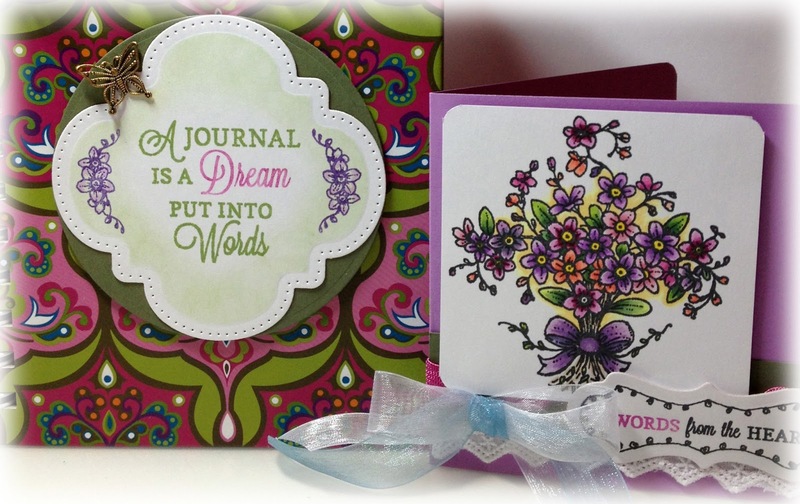 The inside of the card is also complete to match with the overlaying patterned paper. I hope this helps get your Father Day/masculine mojo going! Thanks so much for stopping by and taking a peek! Welcome to this weeks Timeless Tuesday Challenge. I am the hostess and this week is all about weddings! With summer around the corner, so are lots of weddings or wedding planning. 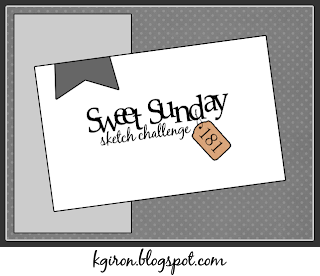 My challenge to you this week is to create a project or card that has to do with, yep, you guessed it... weddings! I have decided to go a little out of the box in creating my wedding "package" in hopes of giving some old ideas a new look! For the fan, I colored in the blossoms and cut around to have it popped up over my Perfectly Pierced Victorian Oval die set. I stamped the background using the Damask Background stamp (retired) while the green ribbon is some wonderful raw silk ribbon I have had in my stash. The background stamp was a perfect size to make the fan and I rounded the corners for a softer look! I completed it by stamping the sentiment from Old Fashioned Florals on the bottom corner and some pearls on the die. The rice cone is one I made using a 5"x 5" piece of Flourishes Classic Cardstock in Ivory and stamped the image where I wanted it once it was to be rolled into a cone. I would suggest a lighter paper or cardstock when making a cone such as this. It will make rolling the cone a lot easier! I then colored it and rolled it up using some Scor-tape to secure. I then determined where to score the top flap so it can connect to the cone. I punch a hole into the cone and flap for the twine to thread through along with the sentiment banner. I stamped and cut out the bee to be popped up on the flap. The tissue pouch is one that I actually was making for my wedding 12 years ago that is from Martha Stewart. It uses an entire 8.5" x 11" sheet of cardstock, again, lighter is better, scored on the long side at 2", 5", and 1". Accordion fold and fold back the ends the length of the tissue and tuck into one another to hold. Decorate as you wish! I used some crochet ribbon and twine to wrap around the top and popped up one blossom cut out to use as the center image. I then added the sentiment and the bee to complete it. I hope you enjoyed my old, yet new wedding ideas! Don't forget to check out the other wonderful projects by the Timeless Tuesday Team! Thanks for stopping by! I hope you all had a great weekend and have some great things in store this week. State testing is in place this week for my kids, so I will be volunteering my time as a proctor for it at their school. 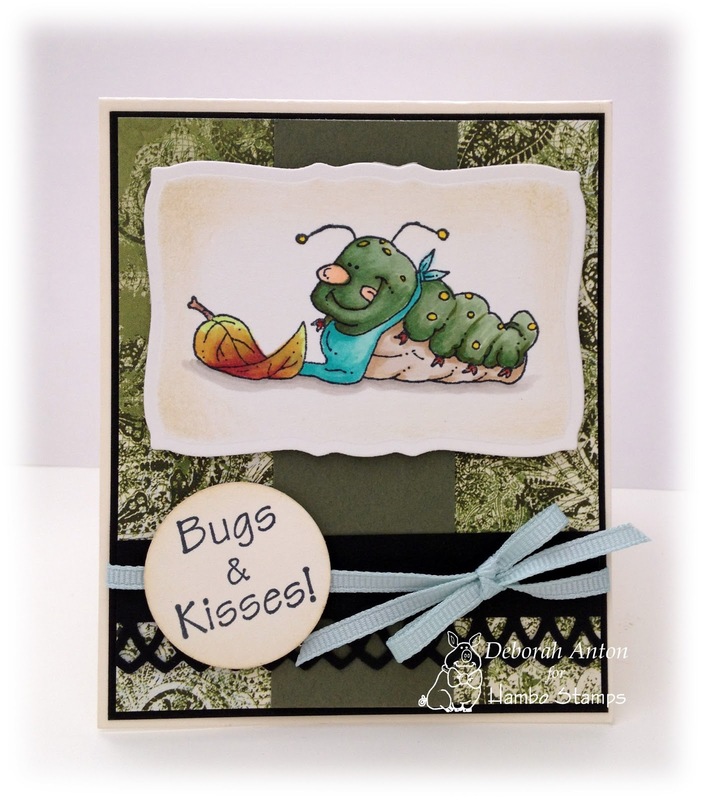 Just a quick card to share using Hambo Stamps Hungry Caterpillar and coordinating sentiment. 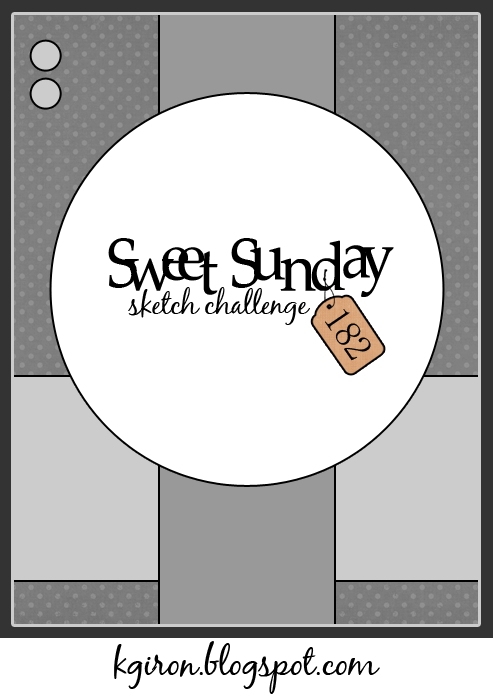 I figured he was a cute one to share for Earth Day and the layout is Sweet Sundays Sketch 182. This is a 4.5x4.5 size card perfect for tucking into a bag or lunch box. The dp is Basic Grey while I used my MS border punch for the strip along the bottom. The image is stamped with Memento Ink and colored in with Copics, cut out with my nesties, and finished with some thin grosgrain ribbon. 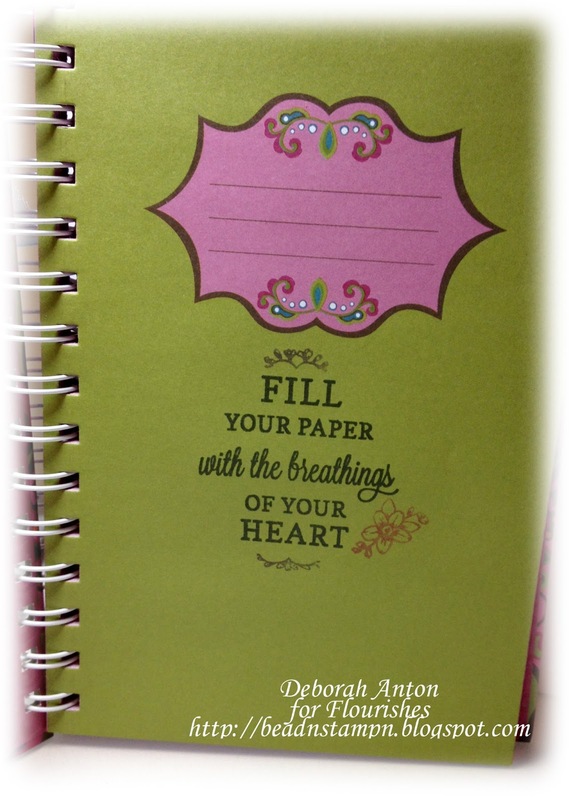 The sentiment is punch out using my 1 1/4" circle punch. Thanks so much for popping by today! Make it a great day! 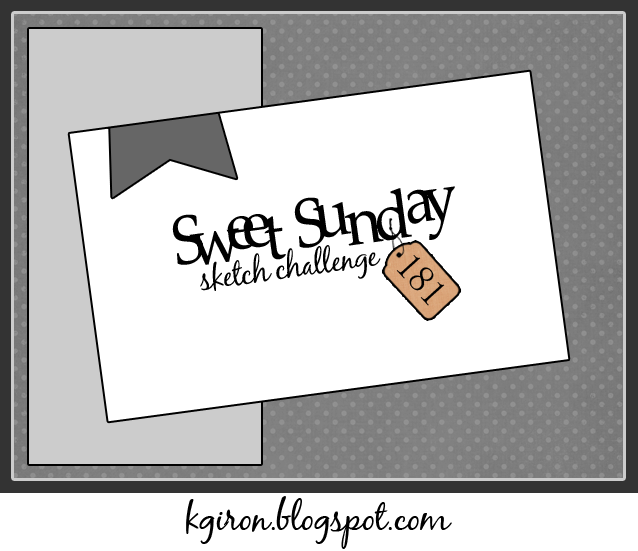 I played along in yesterday in the SCS sketch challenge. It was a really nice CAS layout which you all know I love. 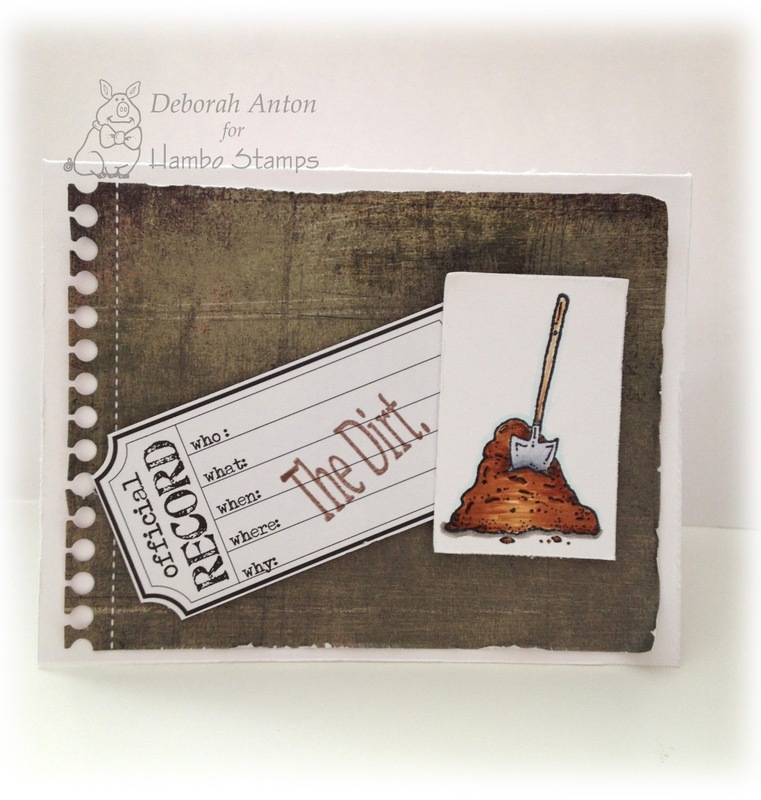 For this card, I used Hambo Stamps Dirt Pile and The Dirt sentiment. I used a journaling tag from Kaisercraft that I have had for a while, which I thought would make for a fun way to stamp the sentiment on. I colored the image with Copics and popped it up over the tag. 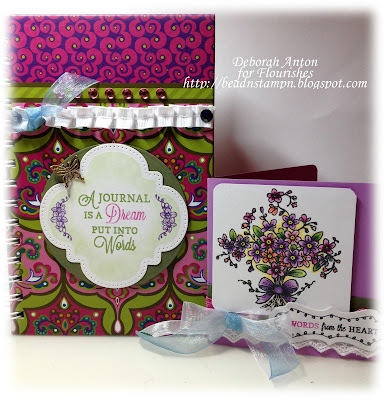 The dp is Basic Grey and I used MFT's Die-namic spiral notebook die for the edge. I finished it off by distressing the edges and bending back the corners. Thanks so much for stopping by and hope you all have a great Thursday!! For my card, I used the image Mouse as well as Cheese to make for a little cheer. The sentiment cheers is from the sentiment/word category and I thought made for a perfect sentiment! :) The dp is Basic Grey, while the rhinestone flourish is Prima. I used webbing ribbon I have had in my stash, overlaid on a piece of green cs. For the image, I colored him with Copics and then traced him with my circle nesties a size smaller so the his tail would stick out. I then fussy cut the circle and tail. I used my labels 11 nesties to over lay the image and pop. The cheese is cut out and popped up too. I finished the card with some Primas at the corner. Thanks for stopping by and taking a peek today! Be sure to stop by the Hoedown to see what other great creations the Bacon Bits have made! Make it a great day! Well, it's Tuesday and that means another Timeless Tuesday Challenge! Cindy is your hostess and her challenge to you is to create a project that incorporates a frame around your main image. 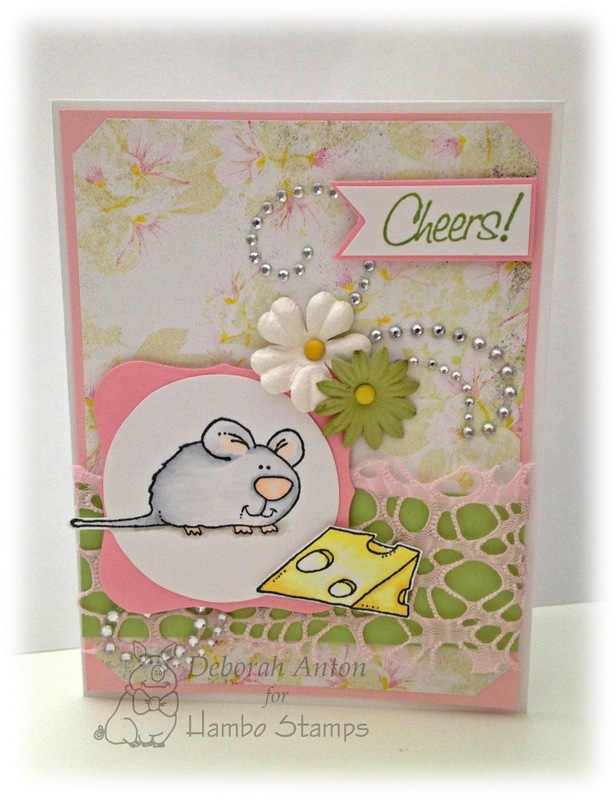 I used MME collection of The Sweetest Thing for the dp and Kraft cs for the base. The scallop border is MS. I popped up the image and the frame and finished the card with some pearls and sheer ribbon. Be sure to stop by the Timeless Tuesday teams blogs to see what wonderful creations they have come up with! Thanks for stopping by! I did need to make a sympathy card for a friend and this is what I came up with. It needed to be quick and when it comes to sympathy cards, I go simple. No need for frills. For this, I used a SU! set for the sentiment and cut it out using MFT's Die-namic doily die popped up. The dp is AC and I finished off the card with some ribbon, a Prima, pearls, and a spray. The inside is finished to match. I hope your week is going well and you are all staying dry or warm in this storm that has moved in. It will be a very wet day here today! Thanks for stopping by! It's Tuesday folks! And that means another Timeless Tuesday Challenge! Broni is your hostess and her challenge to you is Around the House. No, you do not have to finish that sentence, but simply find something around the house to use in your project. A paperclip, staple, wax paper, the possibilities are endless! For my card, I used Flourishes set of Your My Type for the main image which I stamped with Memento Black and red to highlight a few words. 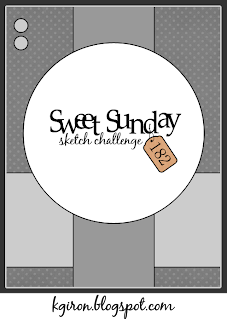 I used Sweet Sunday Sketch 181 for my layout. My around the house item is the mini binder clip. The color match perfectly with this dp collection from MME called In Bloom. I finished off the card by adding a fun crochet flower and some pearls here and there on the dp. The sentiment is popped up. Thanks so much for stopping by and taking a peek! Be sure to stop by the Timeless Tuesday team to see some other wonderful eye candy! Have a great day! Deborah Anton You are here! 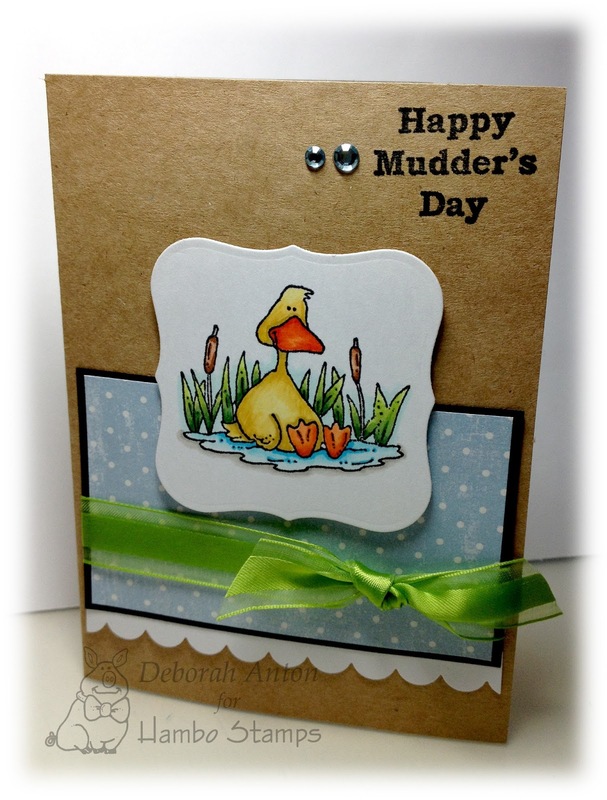 In the meantime, I have put together a Mother's Day, er, um, a Mudder's Day card to share. This darling image is from Hambo Stamps called Sitting Duck and was colored in using Copics and then cut out using my nesties. The Paper is MME and I finished the card with some ribbon, rhinestones, and scalloped border using my SU! Scallop border punch. I have been slowly doing some Spring Cleaning in my craft room, so keep your eyes peeled for some fun giveaways! It's another Timeless Tuesday here and Denise is your hostess! This week's challenge is to use two or more layers of ribbon into your project. I decided to create something a little different this week. I wanted to showcase one of the new releases with a journal project. My intention was to completely create one from scratch, but I came across this particular one and loved all the bold colors. So, I worked around that. For this, I used Forget Me Not Notes set which I stamped one of the sentiments for the outside and cutting it out with the new Perfectly Pierced Classic Window die set. I decorated the journal with some rhinestones and some box pleated ribbon with a hint of sheer, followed by a small metal butterfly. For the card, I stamped the main image and colored it in with Copics to make for a small note to give with the journal. 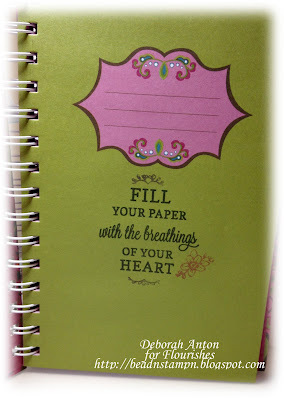 I really loved this sentiment so it just couldn't go without having that somewhere! :) Thanks for stopping by and be sure to check out the other fabulous designs the Timeless Tuesday team has put together!